The following instructions will ensure that SentryPC is installed and working properly on your system. Make sure to follow the instructions carefully and you will be up and running in no time. If you run into any problems please contact our staff with specific details and we will be glad to help you. Before downloading your install file you will want to temporarily disable any anti-virus scanners you have on your system. Some scanners may prevent the download if not disabled during this time. This is not because SentryPC is malicious, but because the scanners misinterpret its monitoring aspects as so. Without the installation downloaded properly you cannot continue with installation. Now you can go ahead and download your install file. You can do so at any time by using the 'Download Software' link in your accounts menu. Your install file is linked to your account and any computer it is installed will be tied to your account. Upon visiting the download page you are presented with the option : 'Require confirmation during installation?'. This determines whether or not confirmation is required to install SentryPC. 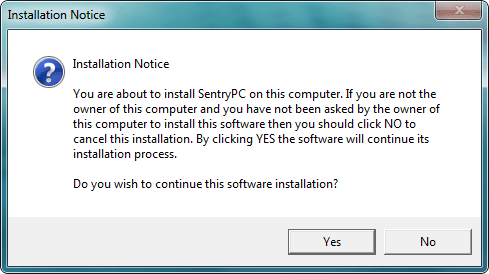 If checked, when the install file is executed on the computer a confirmation popup will show stating that SentryPC will be installed and it will ask the user to confirm the installation. If not confirmed by the user then the software is not installed. If you do not check this option then SentryPC will install without notification as soon as the file is executed on the computer. After choosing your options click the download button and save the install file on your computer. It is important to remember where you save your installation file. Before installing the software you will want to exclude SentryPC's files from any scanner(s) on the computer(s). It is important to note that this must be done for every scanner you have on your system - some people have multiple installed on their computer. All popular antivirus scanners have an exclusion list which you can modify in the scanners settings. What this does is allow you to 'exclude' specific files or folders from being scanned by your scanner. The following list is what you need to add to your scanners exclusion list to prevent it from tampering with SentryPC. If you are unsure how to do this we suggest you refer to your scanners help documentation or contact their support for instructions on how to exclude files as all scanners differ. We also have some basic instructions for some of the more popular scanners on the market which can be found HERE. Choose : Based on your Windows version exclude one of the following folders. It is time to install. You will use the install file you downloaded in the previous steps to do this. Copy, transfer, email, etc the install file to the computer you wish to install SentryPC. You can do this any way you wish - the install file is no different than any other file - the only requirement is it be executed 'on' the computer you wish to install it. The first picture below shows an example of the install file saved to the computer's desktop. Once you have the file available to the computer you want to install you want to right click with your mouse to bring up the option menu. From this option menu select 'Run as administrator' as shown in the second image below. This will execute the install file with administrator privileges. This simply ensures the software is installed with the correct permissions needed for a successful installation. If you selected the notification option when you downloaded the install file you will be presented with the confirmation dialog as shown below. Just click 'Yes' to confirm the installation and SentryPC will be installed. After clicking 'Yes' the software will be installed - there is nothing else you need to do nor are there any other notifications shown to you on the screen. If you did not select the confirmation option then you will not see the picture listed below and SentryPC will be installed without this notice as soon as it is executed from the previous step 4. There is nothing else you need to do nor are there any notifications shown to you on the screen. You have just installed SentryPC! If you wish to install on more computers then just repeat the process above using the same install file (there is no need to download it again unless you want to change the notification option during installation). Once you no longer need the install file you should delete it from the computer. You can always download it again from your account whenever you wish. Now that it is installed you will see activity logs, active computers, active users, and more in your account shortly afterwards. You can now begin setting your options, activity filters, time management options and more for the users of these computers. Login to your online account to do so. Your online account is self-explanatory for the most part, however, you can view the 'Help Documentation' for further assistance or contact our staff if you have questions.